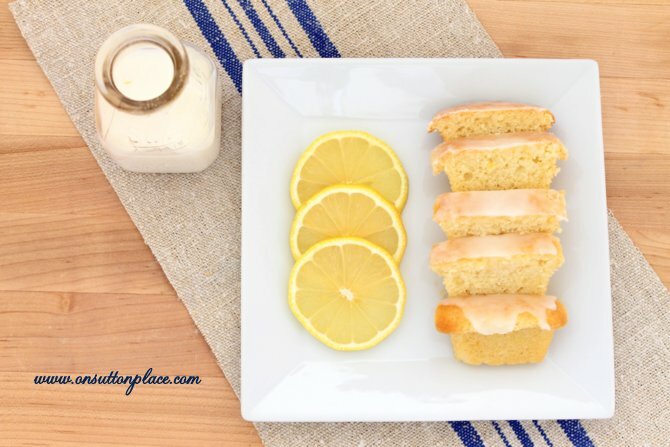 This Starbucks Lemon Loaf Copycat Recipe is so fresh, so moist and so pretty it will become one of your go-to desserts. Makes a great snack too! 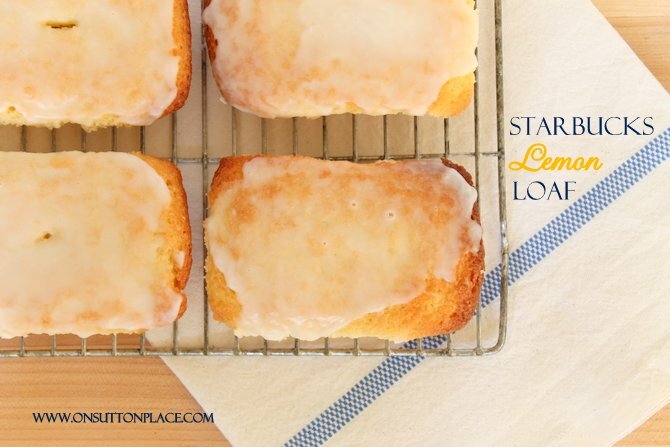 Like most of the recipes I share, this Starbucks Lemon Loaf Recipe is easy and quick. The only things you might not have on hand are the lemon and lemon extract. One of the things I like best about lemon recipes is the actual process of juicing and zesting the lemon. I love everything about it but my favorite thing is the scent. Simply put, the smell of lemon makes me smile. The only tweaks I made to the original recipe were the addition of fresh lemon juice to the glaze and the instructions to scrape the bottom of the mixing bowl. 3 eggs at room temp. Preheat oven to 350. Prepare 9 x 5 loaf pan or 6 mini pans. In a large bowl combine flour, baking soda, baking powder and salt. In a medium bowl combine eggs, sugar, butter, vanilla and lemon extracts, and lemon juice with a mixer. Scrape bottom to make sure all is combined. Pour dry ing. into wet ing. and blend until smooth, scraping sides and bottom of bowl. Add oil and lemon zest. Mix well. Pour into prepared loaf pan(s) and bake for 45 min. (9 x 5) or 25 min. (minis.) Insert toothpick to test...it must come out clean. Remove from oven and let set 3 minutes. Remove bread from pan(s) onto wire rack. Make sure and put a cookie sheet under the rack. Pour glaze over bread. Cool completely on rack. mini = 2 1/2 in. x 4 in. small = 3 in. x 5 1/2 in. large = 9 in. x 5 in. I prepare my baking pans with Baker's Joy. I made mini loaves but this recipe would be perfect for muffins or small loaves. I rarely use a normal, large size bread pan for my quick breads because I have a hard time getting the loaves done in the middle. However, make sure to watch the video that can be found at the end of this post. It shows the bread made into one large loaf and I had no problem getting it done in the middle. The small loaves are much easier to share but if you are making it for your family, one big loaf will work too! For your convenience, I’ve linked to my favorite bread pans in the little widget below. After the glaze is completely set, loosely package them in plastic wrap or Press-N-Seal. Place the wrapped loaves in a resealable plastic freezer bag. Freeze for up to three months. This makes it super easy to grab a loaf or two when needed. Click for more Lemon Dessert inspiration! One of my favorite desserts when I get a latte! Thank you for this recipe, I will surely make this at home! You had me at lemon! The Lemon Loaf is the only baked good that I purchase from Starbucks. To make my own will be a money saver. Plus, I love to bake. Thank you for sharing your lovely gifts. I look forward to receiving all of your emails. Great recipes, photography and creativity. Very good with fresh blueberries added. Am I crazy, but the ingredient list doesn’t say how many eggs…? My pan is 9 x 5. So I finally made this today and it is SOO deliscios! mosit, airy, lemony! I’d accidently zested two lemons instead of one so I used it all, and it is so lemony. Never too lemony for my family Thank you for such a lovely recipe. I’ll make it again and again! Perfect for summer, chocolate cake is so last season now that I’ve met Lemon Loaf! Mine came out like airy cake. So, how many of the “Small” pans do you think this would make? I’m hoping for 4! It’s been a while since I made this…you can get at least 3 small pans, maybe 4. Let me know how it comes out! I’m having trouble printing the recipe. Suggestions? I clicked the printer icon on the top right corner of the recipe and it printed fine for me. Perhaps it’s your browser? If you clear your cookies & cache that sometimes helps. I use Chrome. I know there are sometimes issues with Firefox. Let me know if you are still having problems! This looks delicious! I am planning on making this tonight to give as a gift tomorrow. Do you suggest putting the glaze on right after baking or right before serving? Also, should I leave it at room temperature or put in the freezer? Thanks again for the great recipe! Hi Emily…I’m probably too late but I was away from my computer all day. Put the glaze on the bread after it has cooled a bit so it can set up before you are ready to package/serve it. Not sure about freezing it…I’ve never tried. If you are serving it tomorrow there is no need to freeze it. Hope you enjoy it! I made this the middle sunk in don’t know why. Hi Laura…sometimes that happens if your baking powder or baking soda is old. Also, if you want to try again, make sure to scrape the bowl really well and mix it an extra minute or two so the batter is nice and fluffy. Good luck! I finally made a double batch of this recipe for the first time recently after having it bookmarked for a couple of years. Delicious! For the oil, I used half apple sauce and half oil and it turned out really well. The only thing I would do differently next time is with the wet ingredients….I would mix the butter and sugar until combined, then add the eggs/extracts and mix until combined, and add the lemon juice last. When I put all the wet ingredients together in the mixing bowl I had a hard time getting all the butter mixed in due to all the liquid sloshing around. Oh, and also the lemon juice should be at room temp, too. It was delicious fresh and wonderful out of the freezer, too. Definitely a keeper recipe. Thanks! This is delicious but I’m having trouble getting the loaves out of the pan without leaving a chunk of of the loaf stuck to the bottom. I’m using canola oil spray and didn’t have that problem with the other quick bread recipes. Any suggestions? Thanks. Try parchment paper to prevent sticking. I was wondering if you can freeze this lemon loaf ? I am baking the bread right now for a swim party tomorrow. It smells glorious! 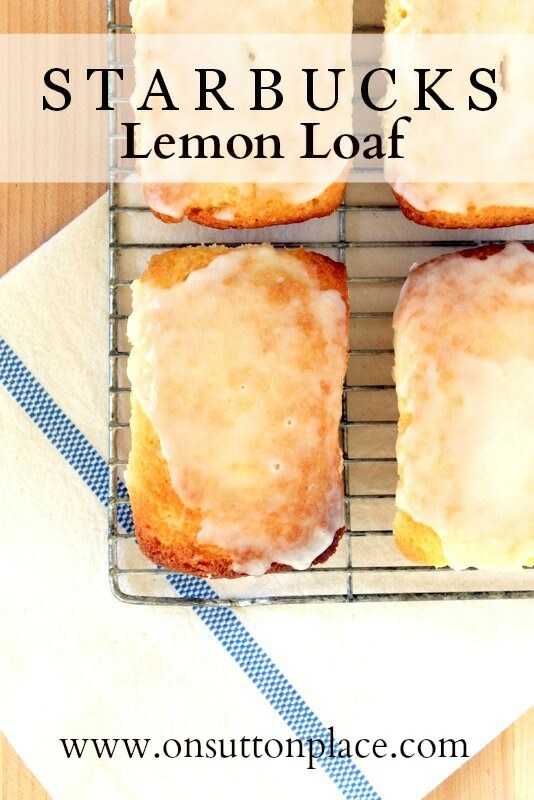 I love anything lemon and this fits the Bill in the batter and glaze. Will let you know how everyone liked it. Thanks for the recipe. Be well and happy and hope filled. I don’t have any mini loaf pans .can I double the recipe and use my regular size loaf pan? Hello, these look yum and beautiful but before i get the lemon extract i would want to know if it tastes like bread or cake since i never tried these at starbucks. looking forward to your help, thanks! I am going to make these tomorrow. They look absolutely delicious. I love how they still look light in color. Many other recipes look dark and overcooked but yours looks PERFECT so I am excited to try this out!! Your quick bread choices are the very best and beautiful photography. When you say ‘mini’ loaves could you give the inside dimensions of your pans? 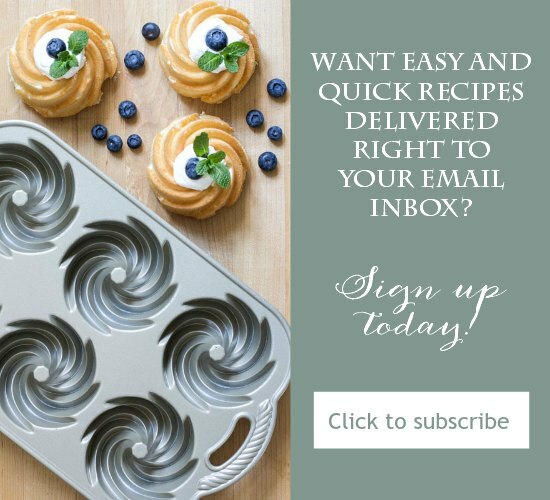 Are you using metal or silicone pans? Yummy! Oh, that lemon loaf looks and sounds so good. I am certainly going to make this. Thank you for sharing the recipe. I just made three minis to take to my daughter at college, and they are beautiful. I am considering taking her two instead of three, as the lemon aroma is driving me to distraction. I only had one and a half lemons, and they were not large. When I needed a bit more juice, I added a dollop of bottled Key Lime juice — I suspect it won’t hurt them a bit. This recipe is easy and forgiving (I ALWAYS mess up at least one step in a recipe, without exception). Thanks! I made it today, I’m not that great at baking but it turned out great! I made the mini loaves. Loved it ! I’ve pinned it already!!!!! How wonderful! We love lemon around here. I have many plans for this recipe. Thank you! Made these today and they were lovely. Glaze was a little runny. Thanks again for a great recipe. This sounds great and I would love to make it today. Just a little concern… Is it really just 2 Tablespoon butter? Wow! The cake sure does look delicious. I love anything with lemons. Oh, YUM! I’m drooling all over my laptop right now. :) I HAVE to make your lemon loaf. Lemon sweets are my favorite.Thanks for sharing. oooooohhhhh….I love anything lemon. I will be trying this one out for sure!! Ooo Ann! That sounds wonderful, I have pinned that and will make it for my hubby, he loves lemon flavoured desserts. Oh my goodness I could just pick one up and take a big bite out of it! Looks delicious! I have never had this since I don’t do coffee, but am going to give this a try. Thanks for sharing. The picture alone makes me hungry and I love lemon. I have a lemon cake in my pantry right now. It’s so refreshing and the smell is wonderful. Can’t wait to try this, but need to get some lemon extract. I’ll let you know how it turns out! Looks delicious. By the way, is that a cutting board you are using as the background in your photos. It looks great. My family are lemon lovers so we keep lemons in the fridge or freezer at all times. This loaf looks so lemony good!! It will be another delicious lemon recipe to try. Thanks, Ann! Ann, do you give samples? I am definitely going to have to try this. It looks delicious with your lovely photos. I have tried it at Starbucks once before and really liked it. Thanks for the printable recipe! That’s my favorite pastry at Starbucks, so delicious! I have to give this a try. I have lemons in the fridge! I might just try this on Monday. I bought the lemons (and honey) for my cold but I think this bread would be much better. Thanks Ann! I love lemon … anything. Thanks for a great recipe, Ann. Thank you, Ann – my DH loves anything lemon, and me, well, I host tea parties – so this is perfect. Love the easy way to print, too, much obliged. Yum, I love anything lemon flavored. Will have to give it a try! My husband loves lemon loaf! I wonder if these would freeze well if I made the minis. Thanks for posting the recipe! Did you use silicone pans? Hi Lana…no I use regular small bread pans. They are Goldtouch from Williams Sonoma and I spray them with Baker’s Joy before I add the bread batter. I love lemon anything…thanks so much for sharing…I can’t wait to try this! Looks YUMMY! Thank you, Ann, for another delicious looking now, but tasting later, lemon recipe. Added lemons to my grocery list. News update: I have been given the award “Best Grandma’s Chocolate Chip Cookies’ Baker” by my daughter’s three children ages 2, 5, and 8. I may have to add a shingle to our front porch. YUM!! And those pictures…hello, get in my tummy. Stumbled AND pinned. Yep, it looks that good! Nummy nummy nummy! When my daughter pulls up to Starbucks for coffee my little granddaughter wants the pumpkin loaf! I’ve got some lemons on my tree and just may have to make this! Your photos are gorgeous, as is your entire site… I’m smitten! 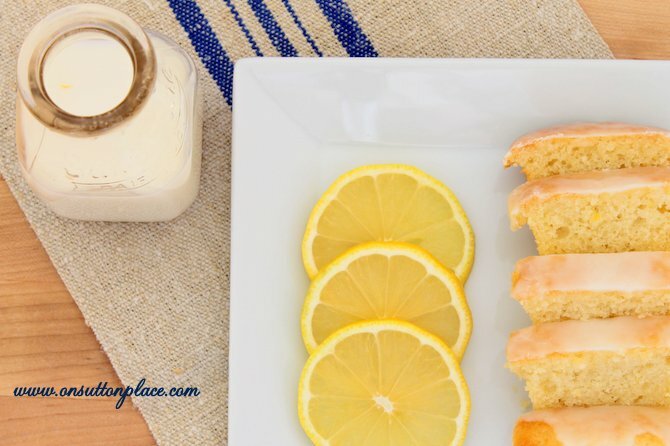 I love that lemon loaf – and I have a whole bag of lemons in the fridge, plus four lemons wrapped up and saved for their juice (I needed lots of zest for another recipe. I will definitely be making this – one for now and one for the freezer. Funny how I was wondering what to do with all those lemons, and then you posted! I love Starbucks lemon loaf! Yours sure look yummy!